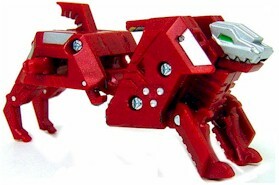 Grakas Hound is an elite mechanical dog-like Bakugan Trap and the Subterra part of the Maxus Dragonoid set. Because it is a part of the Maxus Dragonoid set, it comes only in red color. It can only switch to it's opposite attribute, Ventus. It looks very similar to Dark Hound, which is also found only in the Maxus Dragonoid Set. Purchase your Grakas Hound Bakugan from Amazon now!